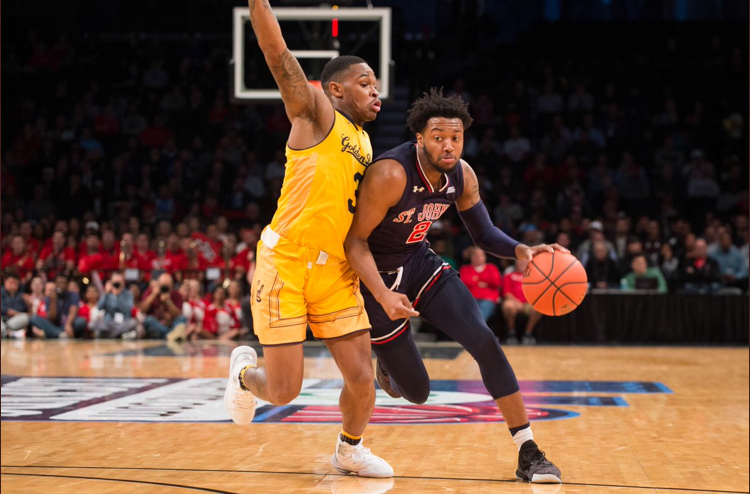 Shamorie Ponds proved on Monday night why he was named the Big East Conference's Preseason Player of the Year, as he poured in 32 points to lead St. John's past California, 82-79, in the Legends Classic semifinals at Barclays Center. St. John's will face off against VCU on Tuesday night at 7:30 p.m. in the championship game. VCU beat Temple 57-51 in the other semifinal game on Monday night. Temple and Cal will face off in the consolation game at 5 p.m.
Ponds scored 16 points in each half on Monday night, and his second half points came in a very unique way. With St. John's down 65-58 with 7:06 left in the game, and he reeled off seven straight to pull them within two, at 67-65. He then poured in nine straight points to give St. John's a commanding 80-76 edge with 18 seconds remaining. Ponds shot 11-15 overall, including 2-6 on three-pointers, with 5 assists and 2 rebounds, in his best game of the young season. His 32 points tonight are a season high and a nice bounceback from Friday night at Rutgers, when he scored just 8 points, but he did have 6 assists in their 84-65 win. Ponds got in going early, as St. John's had to overcome an early deficit. He keyed a 12-0 run, in which he scored eight points, late in the first half, to give them a 32-25 lead with 3:00 left, an d then hit a three in the closing seconds to give them a 38-31 lead at intermission. St. John's kept it going in the second half, as a Marvin Clark II three-pointer gave them a 46-39 lead a few minutes in. Cal came back and took a 56-52 lead on a Matt Bradley three with 9:34 left, and then led 65-58 on Connor Vanover free throws with 7:06 remaining. Justin Simon gave St. John's the lead back, 69-68, with a layup with 3:52 left, and Cal regained the lead a minute later on an Andre Kelly layup that made it 72-71. That would be Cal's last lead, as Ponds was fouled on St. John's ensuing possession and got to the free throw line. Ponds drained a couple of free throws to start his game-defining streak of nine straight points to seal the win for the 4-0 Red Storm. 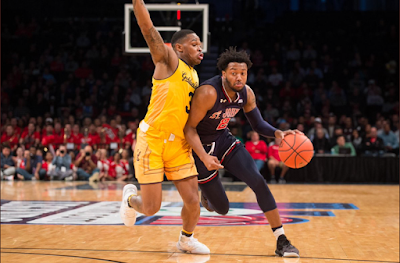 In addition to Ponds, St. John's got big performances from Mustapha Heron, who had 13 points (5-10 FG), 4 assists, and 2 rebounds; LJ Figueroa, with 12 points (4-5 FG, 2-3 threes), 3 rebounds, and 2 assists; and Marvin Clark II, who had 10 points, 8 rebounds, 2 blocks, and a steal. Cal was led by Darius McNeill, who had 21 points on 8-16 from the field, 5-10 on three-pointers, 1 rebound, and 1 assist; Justice Sueing, with 19 points (5-10 FG, 1-3 threes), 9 rebounds, 2 steals, and 1 block; and Paris Austin, who had 17 points (7-11 FG, 1-3 threes), 4 assists, and 3 rebounds. Each team shot exceptionally well from the field, as St. John's shot 54.7 percent (29-53) for the game, while Cal shot 56.9 percent (29-51). Each team made eight three-pointers, with St. John's taking 21 attempts from behind the arc to 18 for Cal.